THAW FROZEN METAL PIPES FAST! Please call 1-800-222-9353 for purchase information as our website is currently under construction. For prices, visit our Price Page. 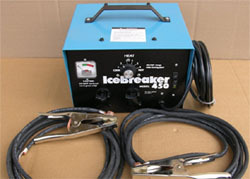 Use one of our Icebreaker Electric Pipe Thawers and get rid of those Frozen Pipes in minutes. Save time, labor and money. 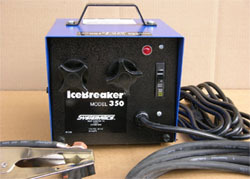 Simply attach the Icebreaker's cables to the frozen pipe on either side of the blockage. Plug in the cord and watch the ice simply melt away and the water begin flowing. Works even when the Frozen Pipes are buried in walls, under floors, or under ground.